With the increase of air pollution and it's harmful health effects we need to come up with methods to filter the air or otherwise produce fresh air for indoor use. 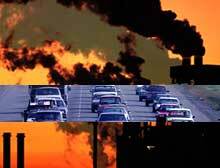 Currently fossil base fuels are the main causes of air pollution in cities, roads and industrial areas. In this project you will gather information and perform an experiment on an existing or new method of air purification.